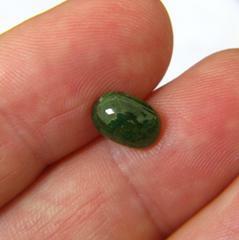 Comment: Long searched-for but never found; best colored tsavorite in cabochon cut. 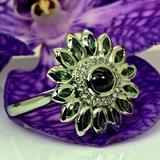 It's done frequently with emerald but so far, I had never seen tsavorite in cabochon cut. Difference to emerald it turns out is a richer color and deeper hue. 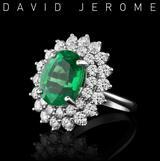 Most cabochon emeralds we come cross are bright grass green or with the typical 2ndary blue, in an open blue- green, often heavily included. 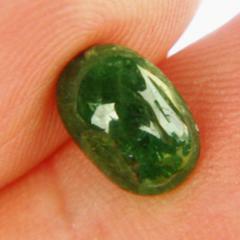 Tsavorite, on the other side, has no visible 2ndary color, only pure green, at least in such quality, no brown, nor yellow. AIG attested 'fine color quality', no treatments (again other than most emeralds), no windows in cabochons as a rule. 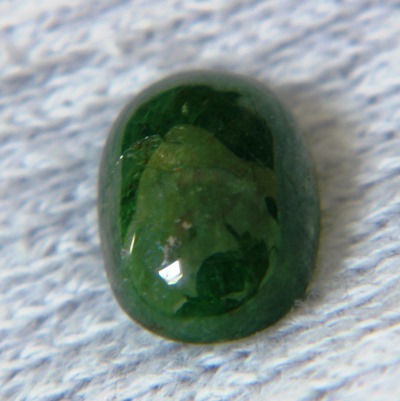 Near three carats, a hefty weight in tsavorite, and big enough for a gents' ring, or a pendant naturally with 10x7mm which would cost five digits in faceted tsavorite. AIG report, free global shipping, WLT certificate and all WildFish perks, all included in our price.